Wendy’s has long since proven it’s not afraid to completely demolish other fast food brands — and even innocent people — with the fury of 140 characters. Chains like Hardee’s have gone after the pigtailed burger chain on Twitter, only to be humiliated in highly public fashion. And yet, it looks like Burger King has found a hilariously petty way to beat Wendy’s at its own game. 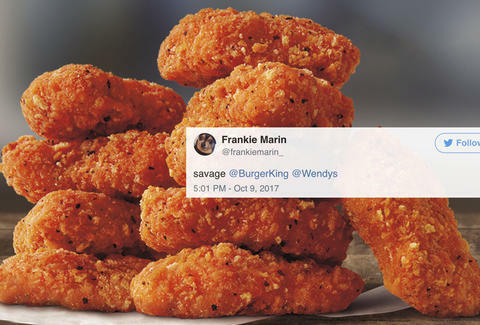 In what’s perhaps the most brutal brand-on-brand attack the internet has seen, BK is marketing the launch of its first-ever spicy chicken nuggets by promoting months-old tweets from disgruntled customers upset by Wendy's unpopular decision to discontinue its own spicy chicken nuggets earlier this year. Promoted tweets appear as advertisements in millions of feeds and are traditionally used to draw attention to a brand's own products, not to shame another company. So, if Burger King’s move is not innovation, then what is? When Wendy's announced its decision to pull the popular menu item back in March, the public was not pleased: Fans declared that "Wendy's is cancelled"; a petition was started on Change.org to resurrect the spicy chicken; tears were presumably shed at spicy nugget-filled Last Suppers. In light of this, Burger King launched its own version of the spicy snack in a brilliant double stroke of public service and public relations. Other recent attempts to publicly shame Wendy's while showcasing the new menu item have included some conspicuously placed billboards and some rather pointed ads. People gotta use our name to sell their "food"
We could declare a winner here, but it'd probably be better if we were all just happy that boxes of spicy breaded chicken are once again available and affordable. James Chrisman is a News Writer at Thrillist who can be quite petty. Send news tips to news@thrillist.com and follow him on Twitter @james_chrisman2.